Walt Disney Studio's have basically cornered the market on the fairy tale princesses. In this new version directed by Kenneth Branagh with a screenplay by Chris Weitz, the live action film is guaranteed to be viewed multiple times by young girls and tweens in the coming weeks. It will also spur a huge marketing movement of romantic fantasy clothing and accessories that may out do Frozen. But despite it's obvious money making trappings, the movie itself if entertaining and totally delightful that will even the brothers of the target audience will not mind watching...well maybe. At least it's not a musical. Everyone is familiar with the story of the plucky young woman, Ella (Lily James) who is raised by loving parents in the woods. Her mother passes on advice on her death bed to her sweet daughter, “have courage and be kind”. Ella who has a special relationship with the woodland creatures and the house mice, takes the advice to heart, especially when her trader father comes home with a new wife and her daughters. The classic evil stepmother Lady Tremaine (Cate Blanchett) treats Ellas like a servant, and becomes worse when her father passes away. The two step sisters Anastasia (Holliday Grainger) and Drizella (Sophie McShera) are selfish, vain and not very bright. But they nickname Ella Cinderella when she sleeps in the ashes by fire to keep warm. Despite her ill treatment, Cinderella finds solace in the forest where she cute meets the handsome Prince Charming (Richard Madden) who doesn't reveal he's a prince. He says he's an apprentice at the castle named Kit. The Prince is totally smitten with the unknown woman, so when his dying father tells him that they are throwing him a ball so he can chose a wife, Kit requests that the party be open to all eligible women in the kingdom on the off chance she will show up. Of course the stepmother refuses to let Cinderella attend, ruining her mother's dress leaving the poor woman in tears. Of course the fairy godmother (Helena Bonham Carter) shows up chanting up some “bibbity-bobbity-boo” to turn the pumpkin, mice, lizards, and goose into her coach and footman. Not to mention whipping up a dress to die for complete with glass slippers. 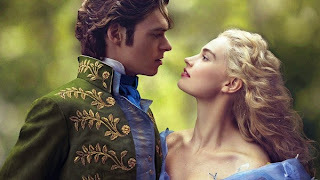 The meeting of the beautiful Cinderella and her handsome Prince Charming at the dance will bring swoons from all. When the clock strikes midnight, Cinderella has to make her grand escape leaving behind her shoe. The Grand Duke (Stellan Skarsgård) is trying to manipulate the prince into marrying a certain princess, and his plan was overheard by Lady Tremaine who tries to black mail the Duke if she keeps the Prince who is now the King from finding Cinderella. The writers did try to slip in some sympathy for the stepmother's motives. Of course we all know the perfect ending to a precious story living happily ever after, and everyone leaves the theater smiling. The costumes, sets and colors makes this a visual delight. The young lovers, two impossibly pretty people, are highlighted in a glow that makes their teeth sparkle. It will no doubt result in the live remake of other animated classics in the near future.